Pythons (genus Python) and anacondas (genus Eunectes) both belong to the family Boidae. They're closely related and share many of the same characteristics. They do have a few differences that distinguish them from each other, however, they're often still confused with each other. Both are particularly large-bodied, long snakes that use their strength to subdue and kill their prey. Both anacondas and pythons inhabit warmer climates, although their geographic ranges and habitat choices vary. Anacondas, for example, are semi-aquatic snakes that prefer marshlands, swamps, slow-moving rivers and streams. Pythons vary greatly in their choice of habitats. Most pythons are native to the Old World, while anacondas inhabit South America. Both pythons and anacondas are constrictors, meaning they wrap around their prey and squeeze tightly until their prey can't breathe. When capturing prey, these animals latch on with their teeth and quickly send coils of their body around the prey and then they begin the constriction. Once the animal has stopped breathing, the python or anaconda unhinges its jaw while its muscles work the prey down into its stomach. Most pythons and anacondas are ambush predators, although they sometimes are opportunistic. While size varies greatly between the different species in each genera, one thing is certain: Boidae contains the largest snakes in the world. 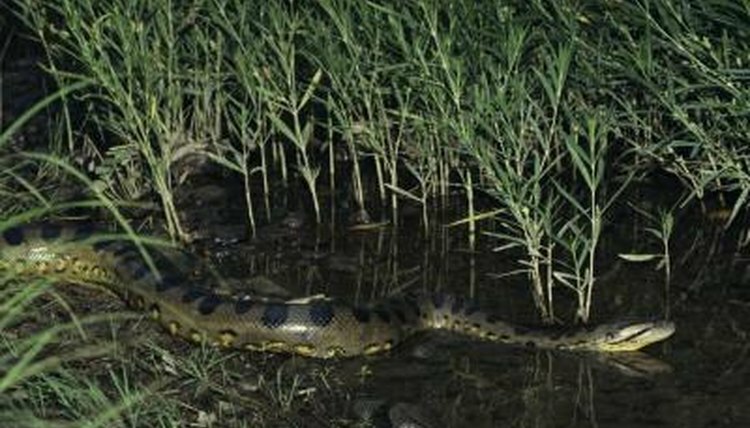 On average green anacondas grow to about 20 feet; a 28 1/2-foot-long, 320-pound female reticulated python named Colossus lived in captivity at the Pittsburgh Zoo. Both pythons and boas -- anacondas are boas -- have remnants of both hind legs and pelvic bones, something rare in the snake world. They both also possess two lungs instead of one. As far as differences go, pythons lay eggs while boas give birth to live young. Pythons also have an additional bone in their head and more teeth than boas.